Never before has there been a resource this comprehensive, this practical, and this relevant for teaching the New Testament to your students. With the topic overview, ideas for games, outlines for messages, study questions, ideas to incorporate media or real-life experience into the teaching, and a searchable CD-ROM, you now have everything you need to lead students through more than 100 New Testament lessons. 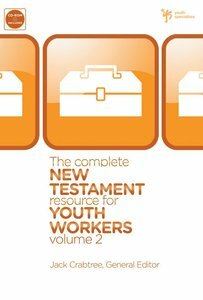 About "The Complete New Testament Resource For Youth Workers (Vol 2)"
With lessons created, written, and tested by active, experienced youth leaders who work with young people every week … never before has there been a resource this comprehensive, this practical, and this relevant for teaching the New Testament to your students. Walking students through the New Testament used to feel like a daunting task-especially if you've tried to create studies that are relevant and engaging to your students. Now, you have a diverse team of nearly thirty youth ministry practitioners working for you-and they've put together more than 100 studies that will make your job easier while helping your students dig into the Bible. Whether you lead them yourself or hand the lessons over to your volunteers, each lesson is easy to implement and can be used alone or combined with lessons that have already been planned. You'll also find a searchable CD-ROM, making it easier than ever to find exactly what you need to help lead your students deeper into the life-changing books from the New Testament. Crabtree is a teacher at McKenzie Study Center, focusing on doctrine, biblical languages, Genesis, church history, and philosophy of education. He is also president of and a teacher at Gutenberg College, and a pastor at Reformation Fellowship. Crabtree and his wife, Susan, currently live just outside Eugene, Oregon, with their four children.